Add glaze to your cabinets for a custom look. There are different color options you can use to glaze your white cabinets. Similar to a stain, glaze provides a dark line around each crevice and detail in your cabinets. 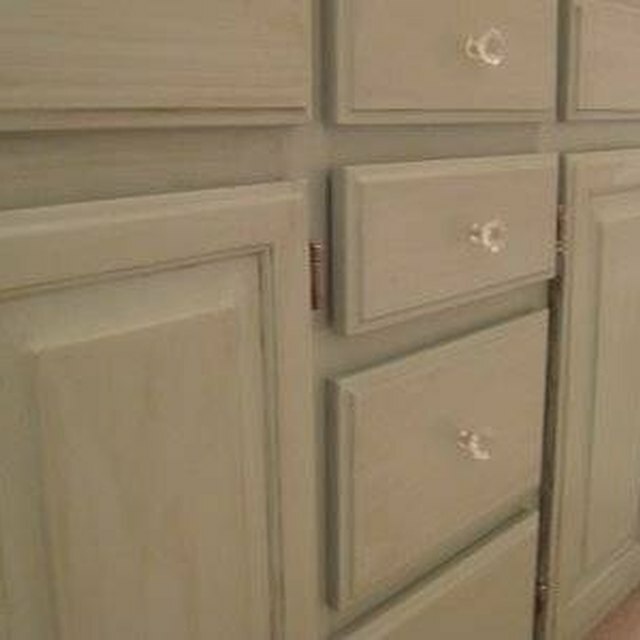 Glaze can be wiped clean and only left in the details, or it can be left streaky to give your cabinets an antique look. The method of applying the glaze for each look is identical. Add glaze to your white cabinets for a custom look. Remove the doors and drawer fronts from the cabinets using a power drill. This will allow you to glaze each door flat as well as glaze the cabinet face easier. Glazing can be done without removing the doors and drawer fronts, but removing them will provide a better finish. Clean the cabinets with mineral spirits and a wiping cloth. Mineral spirits will remove the oils that on the cabinets. Allow the cabinets to dry. Open the glaze container by prying the lid off with a flat screwdriver. Stir the glaze with a stirring stick. Make sure the glaze is uniform and fully mixed. Apply the glaze to a small section. It is important that the glaze covers the entire surface of the wood. Wipe the glaze off using a wiping cloth. Glaze is designed to be left in each crevice and detail. Glaze can be wiped clean on the flat sections or left streaky, depending on what type of look you want. If you wipe too much glaze off, you can re-apply until you are happy with the results. Continue glazing each door, drawer front, and cabinets until complete. Allow the glaze to dry. Refer to the label on the glaze container for drying times. Re-attach the doors and drawer fronts to the cabinet boxes. Glaze one door and match each cabinet section to that specific door to provide a uniform look. Living in Utah, Jared Curtis graduated in 2005 with a Bachelor of Science degree from Utah Valley University in Orem, Utah. Curtis is continuing his education in hard sciences to apply to medical school in the future. He began writing professionally in 2010, specializing in cabinet-related articles.